Glensaugh is a managed natural environment which highlights the concept of sustainable upland estates and the necessity of building on available renewable energy resources, in this case wind, water, solar energy and biomass. International agricultural journalists had a unique opportunity to see environmental science in action at the James Hutton Institute farm at Glensaugh, as part of the activities organised during the International Federation of Agricultural Journalists 2014 congress, held in Aberdeen under the title Innovations from a small island. Glensaugh, lying on the footslopes of the Grampian Mountains, is an upland estate which has been used for hill farming and land use science for over 60 years. In its early days research at Glensaugh was focussed on the productivity of its livestock systems while in recent decades the focus has shifted towards the dynamics of its grazed ecosystems. The challenge researchers at Glensaugh are tackling today is how to develop land use systems which deliver food at a reasonable cost in both environmental and economic terms. 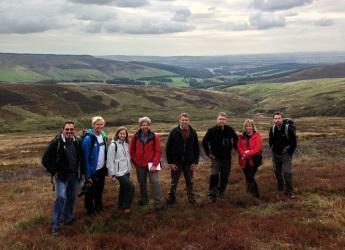 The group, which included visitors from the United States, South Africa, Slovenia, Norway and Scotland, was able to gain an understanding of the trade-off between production and conservation in Scotland’s hills and uplands. Donald Barrie, manager of Glensaugh, said: “In recent years, research at Glensaugh has shifted from agricultural systems towards the dynamics of the environment. Environmental science is very much what we do here now. That environmental science, however, still uses our animals, and those animals have now a walk-on part. A very good example of what we do is a study we are running involving sheep and deer grazing in the landscape. We are interested in how those animals behave and relate to the landscape. “That ties in very nicely with our long-term thinking that the agricultural systems that will succeed in the future are those who closely mirror natural production systems. What we’re finding is that the sheep and the deer form very strong and close associations with their environment, and it’s by managing those animals by allowing them to subsist in an environment as natural as possible that we will make a successful commercial enterprise, on the back of a natural production system. Steve Werblow, freelance journalist from Oregon, United States, and regular contributor to The Furrow, John Deere’s publication for farmers and ranchers, commented: “It’s been a great day. The emphasis on making hill farming more environmentally and economically sustainable is really exciting. Besides hosting the visit at Glensaugh, the James Hutton Institute was pleased to support the IFAJ 2014 congress by providing a talk by Dr Julie Graham at the ‘Market-makers: Field Scale Vegetables, Specialist Crops and Fruit innovation’ tour, as well as by attending several networking and social engagements organised by the IFAJ and the congress sponsors.